Deferred maintenance is when repairs to a property or machinery is delayed. The delay can be seen as a cost cutting exercise as well as a means of meeting budgets. When maintenance is postponed it is normally due to lack of funds. The work needed to be carried out is postponed until there is enough budget to allow repairs to take place. While it can be seen as an ‘easy decision’ to not complete needed maintenance, it can result in a higher expenditure to fix the initial problem and subsequent repairs. Furthermore, delaying the inevitable reparation can and will have a knock-on effect. If a company doesn’t repair its air conditioning unit in a timely manner, they are risking an increase of burden on other assets such as its electrical system. This in turn could escalate the risk of fire and/or injury to employees and/or customers. The refusal to fix a problem when they occur could taint a company’s brand or make home repairs twice as expensive. When deferred maintenance is necessary, often a budgetary/financial ceiling has been reached for a particular month, therefore deferring repairs to another month. It is important for those who choose to defer repairs to prioritize them for the following month – assuming no budgetary constraints for that month appear. It would be very easy to neglect or under address the maintenance. With significant improvements made in technology, companies can easily invest in a system that would monitor and recognize possible failures before they occur and therefore interrupt operations and then subsequently cost the company more money. Having a monitoring system in place allows for planning. When maintenance is planned, it allows for the correct allocation of budget to ensure any problems that may occur, to be addressed immediately. For the homeowner, it is better to set aside a budget for repairs and better to replace a broken gutter before the water continuously leaks, causing mold or weakening the foundation of the house. 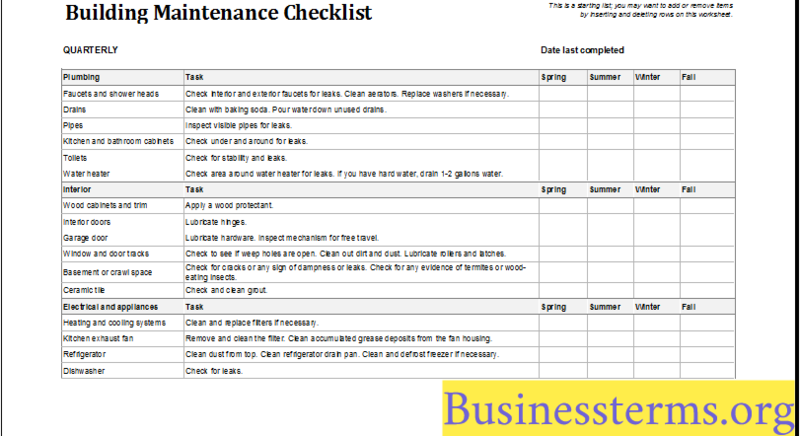 Why is Maintenance Often Deferred? There are not enough people to carry out repairs. No skilled labor within the company/home to do the upkeep. There is future construction (for a business) and this would address any necessary maintenance. Carrying out repairs would disrupt (business) operations. Parts are not available to fix the problem. To manage any outstanding deferred maintenance, a company needs to comprehend how much upkeep is required. A calculation or what is known as a ‘facility audit’, will assist in removing unknowns and provide a better/clearer idea of how big a problem deferring maintenance has become, or if it will become one. The assessment should involve all parties with building expertise and experience. For example, the technician responsible for the HVAC system would have knowledge of how many times in the past it has been repaired. A simple checklist (below) is often all that is needed. When regular checks are made, it would be easier to identify whether deferring a repair is economically sound. Those responsible for the allocation of budget are more than likely to apportion maintenance funds to other areas within the business. If facilities management write a report identifying assessed risk potential, it can also point to whether employee efficiency declines as well as how it will affect business operations. Historical information will show how deferred maintenance increases costs over time and how there are penalties to not carrying out repairs in a timely manner. When looking to reduce the backlog of maintenance, it is important to concentrate on essential repairs. Creating a set of measures to identify which projects are to be looked at first would be essential to this as budgets rarely cover all of the surfeit of deferred maintenance. Currently Serious – immediate action required. Potentially Serious – will become critical if not addressed within a particular time period. Necessary, not Serious – needs attention soon. Any projects that have health and safety implications would be categorized as immediately in need of attention. Of course, other factors such as environmental impact, tenant or employee retention and also improving employee production can be included. To reduce deferred maintenance, companies would need to consider third parties such as ‘Energy Service Companies’. These entities will appraise facilities and determine energy efficiency and ways for it to be improved. They can finance and install new equipment that will positively impact energy costs. Any monies saved can subsidize other improvements and possibly decrease the deferred maintenance. Acting early on any deterioration will have a positive impact on cash flow. The quicker the intervention, the faster repairs are carried out and the better it is on future budgets. More significantly, the buildup of deferred maintenance is reduced before it overpowers budgets and resources. If the company/homeowner is aware of the life expectancy of a given item, it can reduce any need for deferring maintenance. With normal wear and tear, paint should be repaired every two years, carpet replaced every ten years and unit heaters 13 years. These are all estimations, of course, and doesn’t factor in areas of high usage e.g. a reception area, which has higher foot traffic and therefore maintenance required more often. Deferring maintenance may appear to be a rational short-term solution however, it can lead to a long—term effect such as operations being shut down yet staff still needing to be paid even though they are unable to work. Option 1: Fixing the roof upon finding missing roof shingles. Outcome: the initial budget outlay will be for the cost of the shingles. From this point, annual checks should be made especially after severe weather. All the while a specific budget can be created to fix the entire roof at a later stage. Option 2: Don’t replace the roof shingles due to budget constraints and repair later. Outcome: the repercussion of may be further damage is caused by rain/server weather causing the whole roof to become more damaged and thus costing more money. Furthermore, an inspection of the house, when the homeowner wants to sell, may reveal the house could have been sold for significantly more money, if repairs had been managed in a timely manner. 1. What is the main reason for deferred maintenance? 2. What is the best way to reduce the backlog of deferred maintenance? A. Fix a couple of things one month, a few next month and so on. B. Prioritize the necessary repairs. C. Apportion a significant amount of budget toward the repair of one thing. 3. For a company, besides a risk of decreasing production and health and safety hazards, what is another negative impact of deferred maintenance? C. Losing funds when budget is allocated.